Last modified on March 4th, 2015 by Joe. Aesthetics is critical in mobile world. Beautiful functional design is key to success of a mobile application. 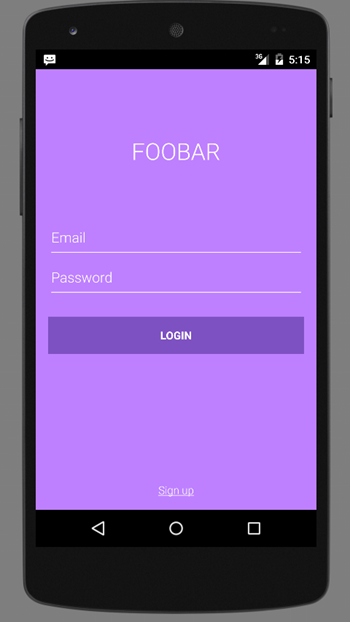 In this Android tutorial, let us work on designing a clean and lovable login screen for an Android app. This is a repeated task and every Android developer will come have across this, if not sooner. In this tutorial we will focus on design as well as the backend functionality. When the user enters the username/email and password, we will validate the user input, then cross check with the credentials store and decide on authentication success or failure. The example app accompanying this tutorial can be used by you as a component for your Android mobile application. Its free for you. The Android mobile viewport is logically divided into three parts. Upper part contains the LOGO. Middle part contains the input elements. Bottom part contains the link for “Signup” activity. When the layout is coded, care should be taken to obtain the above in a generic way. Should I say in a responsive way. The point is, the UI should not break for different mobile device sizes. These three component should be evenly spaced in any device. I have chosen a bright background color. Its lilac flavored color tone. Its applied to the root layout element and you can change as per your liking. Remember, Login button has the darkest hue of the background color. All the other elements are in white color. This design follows the latest trend and a safest design principle. I have used the “Roboto Light” font for the text. It looks sleek and neat. Once the user submitted the login button, a progress spinner is shown. Auto complete for email input. Authenticate the input using an AsyncTask. On success forward to a main Activity. On failure show error message on Login screen. On click of “Sign up” forward user to SignupActivity. * Validate Login form and authenticate. * Shows the progress UI and hides the login form. // and hide the relevant UI components. //Create adapter to tell the AutoCompleteTextView what to show in its dropdown list. //  login success and move to main Activity here. Comments on "Beautiful Android Login Screen Design Tutorial"
i am getting an error in the styles.xml file on the itemname color control normal,can someone plese help me to resolve it?? Comments are closed for "Beautiful Android Login Screen Design Tutorial".